We are manufacturer of Compressor for Steel Industries. 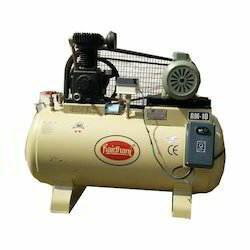 We manufacture air cooled air compressors for different industry. These compressors are available with the clients' specification. - Multi - stage compressors are rugged packages for use either as a total air system for small industrial installations or a backup system in major installation. We have marked a dynamic position in the market by providing the finest quality range of Air Cooling Danfoss Compressor Unit. Capacities Ranging from : 28.2 - 43.2 CFM. Working Pressure : 10.5 Kgs/Cm^2(g).